I think brunch at home is pretty much the greatest thing ever. It’s just like a delicious restaurant brunch, except it’s totally acceptable to enjoy it while wearing pajamas + rockin’ some serious bedhead. Most weekends, I try make at least one nice brunch at home, featuring eggs, bacon, pancakes, biscuits, and/or homemade bread. A couple weekends ago, I noticed that I had a couple potatoes hanging around the kitchen, so I decided to incorporate them into that morning’s brunch. I went for a fairly simple recipe, since I wanted to use only ingredients that I already had handy in the house. The result? 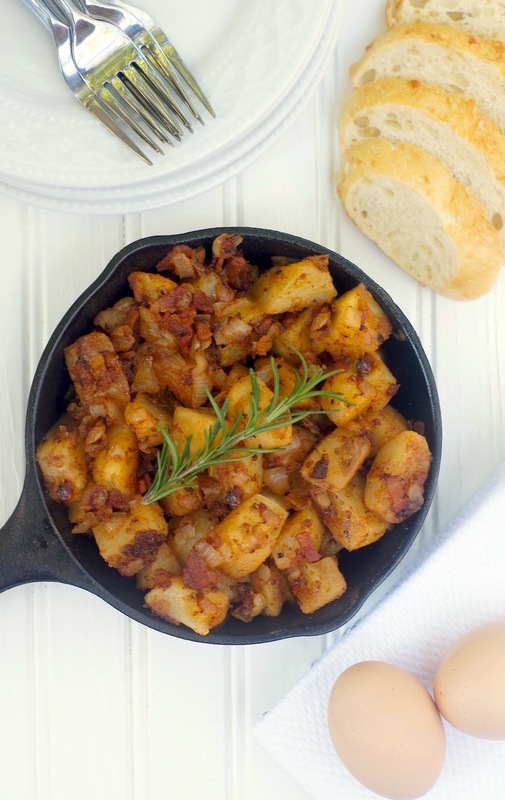 Flavorful, skillet-fried potatoes with sweet caramelized onions, salty crisp bacon + a good dose of savory spices. Despite being a basic, easy recipe, these potatoes were mighty impressive – full of wonderful flavors + textures, and total comfort food. I served them with fried eggs + toasted homemade bread, which made for a fab brunch at home. 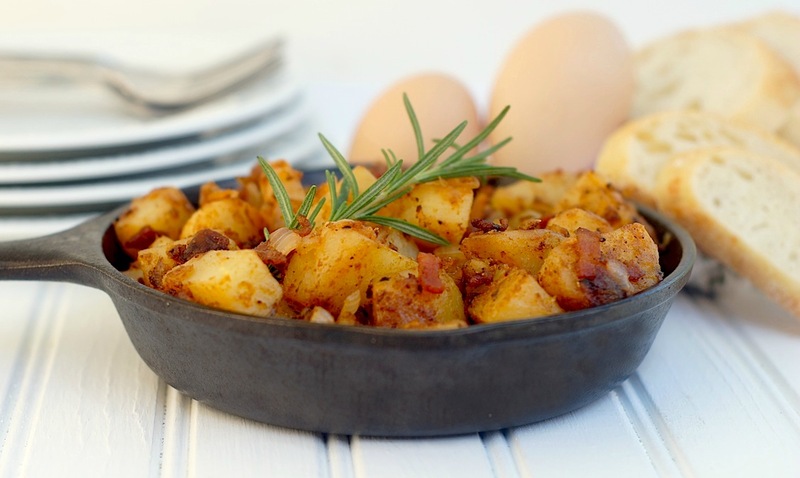 So, next time you want to kick your breakfast or brunch up a notch, give these fantastic skillet potatoes a try! place potatoes in a large pot + cover entirely with water. bring to a boil + cook until potatoes are fork tender. when they are ready, place the potatoes on a cutting board + dice into 1-inch pieces. set aside. heat a large skillet over medium heat. add in the bacon. cook bacon until it’s crisp, then remove from pan + set aside. pour off all but 1 tablespoon of the grease. add the onions into the same skillet, + cook on low heat, stirring occasionally, until onions begin to caramelize, about 15 minutes. next, add the diced potatoes, cooked bacon, paprika, garlic powder, flour + salt + pepper to taste into the skillet. stir well + then slightly press/pack them down. cook them without stirring for several minutes. you want the pan to be hot enough to crisp the potatoes but not hot enough to char them. cook for several minutes on one side, + then flip them with a spatula, press them down, + cook on the other side for a few minutes. add more salt + pepper to taste if needed, + cook until desired brownness. This looks like this weekend’s brunch…or brinner if I can’t wait that long…Question…Could I possibly create your masterpiece with sweet potatoes instead?…Or would this not do the bacon/caramelized onion garnish justice? !….My husband will devour this offering…really…He is French…but loves all things having to do with American Brunch Fare. OOps..Forgot to ask…I noticed in your pics that the potato cubes are not “smashed”…did you do the mentioned “pressing” technique…or were your potatoes simply firm?…Should it have more of a galette/frittata-esque…flattened appearance after “finishing”? ?..Thank you for any advice! 1. Yes, you could absolutely do this with sweet potatoes instead. In fact, I think it would be absolutely delicious with sweet potatoes – good idea! 2. The “pressing” technique is to get a good browning/crust on the potatoes, more so than to “smash” them. You definitely could smash ’em if you want, but the pressing technique is more like packing them firmly in the pan to ensure they are in great contact with the heat. Hope that makes sense! Hope you + Your husband enjoy this dish! Could I boil the potatoes the night before so I have less steps to do in the morning?